I’ve put up a brand new infomercial review. The Myotron Pulse Wave infomercial was the most absurd infomercial I’ve seen and Santo Gold was the strangest infomercial I’ve seen. 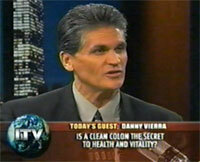 But the infomercial for The Almighty Cleanse with Danny Vierra has to be the grossest infomercial I’ve ever seen! Like the Dual Action Cleanse infomercial, the Almighty Cleanse sells a colon cleansing product. But creator Danny Vierra goes a lot further verbally and visually than Klee Irwin was willing to go. This is a truly craptacular infomercial! Check it out: Almighty Cleanse. That picture of the poop is so digusting it’s hilarious! I’m surprised TV stations are willing to show the Almighty Cleanse infomercial. The best part is when he says that he met a lady who goes to toilet only once a month. That is halarious (hilarious does not fully describe the scenario, hence I am using a wrong word!). Probably even Kangaroo rats cannot achieve that feat!